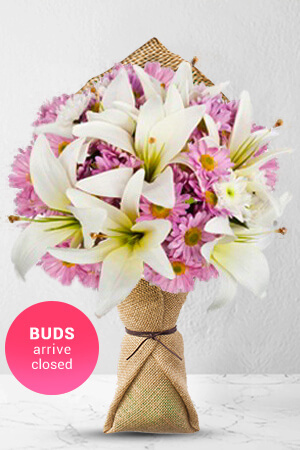 As delicate and loveable as Tinker Bell herself, this enchanting combination of sweet pink Chrysanthemums and pure white Asiatic Lilies is a sure way to articulate the magical messages of joy and happiness that your loved ones bring to your life.Lilies may be sent closed/partially closed in order to prevent damage and to last longer.The vase in the picture is not included, however if you would like to make your flower gift extra special, why not add a vase to your order? We recommend a Premium Vase to leave a lasting impression. Did not see the flowers but the recipient seemed happy. Excellent. Recipient was very happy . A suggestion. It would have been nice to actually see a photo of what you did send, for future reference like an email. I might like to send something different next time. What areas do you cover.? Always great to order here, knowing that the actual product will be even better than the photos, and at a great price.